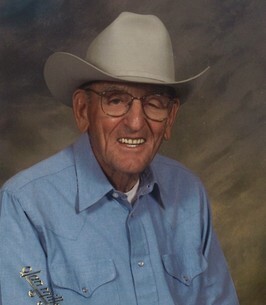 Orville Lee Thomason, 97, of Hudson passed away on November 28, 2018 at NCMC in Greeley. He was born January 13, 1921 in Cabool, MO to William and Laura (Dowdy) Thomason. He grew up in Guthrie, OK and at the age of 8, Orville accepted Jesus Christ as his Lord and Savior. He completed the 8th grade and the family moved to California. He was drafted into the U.S. Army on October 27, 1942. He served in the South Pacific on the islands of Kwajalein, Engebi, Saipan, and Okinawa. Orville was honorably discharged on December 15, 1945 as a Staff Sargent. He came to Colorado after the war and met Waunita Mae Nichols. They were married in Cushing, OK on January 13, 1951 by his brother. Orville worked for a time on a dairy in California before coming to Colorado. He farmed in the Hudson area, and after Orville married, he had his own dairy which he sold in 1970. He built the family home on the farm and enjoyed woodworking, creating pieces for craft shows under the name “The Deacon’s Bench”. Orville’s faith was an important part of his life, sharing his love for Jesus and witnessing to others until his death. He was an active member of Hillside Baptist Church where he served as a deacon and Sunday school teacher for many years. Thankful to have shared his life are his two daughters; Karen (Rick) Thomason-Love of Timbo, Arkansas and Kendra Thomason of Hudson as well as numerous nieces and nephews and their families. He was preceded in death by his parents, wife Waunita, sister, Ruth, and 8 brothers; Estel, Paul, Kenneth, Carl, Herman, Clyde, Max, and Bill. Visitation will be held from 4-7 p.m. Tuesday, December 4 at the Adamson Community Room, 4650 W. 20th Street. Life Celebration Service 10:00 a.m. Wednesday, December 5 at Hillside Baptist Church, 2436 9th Ave., Greeley. Interment Hillside Cemetery, Fort Lupton with a reception following at the Four Way Baptist Church, 9966 WCR 41, Fort Lupton. Memorial gifts may be made to “Hillside Baptist Church” for disaster relief in care of Adamson, 2000 47th Ave., Greeley, CO 80634. Condolences may be sent to AdamsonCares.com. We encourage you to share any memorable photos or stories about Orville. All tributes placed on and purchased through this memorial website will remain on in perpetuity for future generations.